The Second 100 Chinese Characters adopts a structural approach that helps students to learn, recognize and write the second 100 most common Chinese characters. 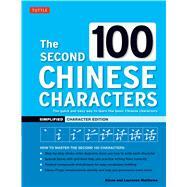 Intended for beginning Chinese students, the characters listed have been carefully selected and sequenced for rapid and effective learning. Each Chinese character is shown separately on a single page, along with its English definitions, pinyin romanization, alternate form (if any), a stroke-order guide and ample space for writing practice. Printed in gray lines, the stroke-order guides introduce the student to the standard stroke sequence used in writing the characters by tracing them. After learning the correct stroke order, the student can then practice writing the characters on their own, thus reinforcing the recognition and memorization. Large boxes with grid lines for correct proportions are provided. Related compounds and phrases containing each character are also included to assist in vocabulary building. Three indexes—alphabetically arranged by the English meanings, by pinyin romanization, and by radicals—are provided at the back of the book for quick and easy reference.